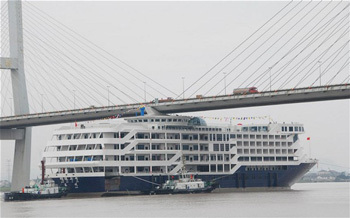 A newly-built luxury cruise ship managed to collide with part of a bridge in China on Friday (5/25), chopping off the chimney after falling victim to high tide. Captain Guo Lai, at the helm of the Pearl No 7 line in eastern China, also reportedly failed to take account of the fact that the [$42 million] ship – 518ft long and 98ft wide – was sitting higher on the water because there were no passengers or cargo on board. Some witnesses said that the bridge, which is built over the Oujiang River, swayed slightly after the collision. Yang Tao, chief engineer of the bridge’s owner company, said the city’s maritime safety department is investigating the cause of the collision. Apart from the chimney, the ship did not suffer any major damage, although it returned to the shipyard for repairs. Three bandits were foiled in Britain when their attempt to pry open a stolen cash box ran up against a new security system that slathered the bills with glue. Baffour Amponsah, 25, Brian Ocaya, 28, and Daniel Collins, also 28, were part of a gang that ambushed a cash delivery man working for a security company G4S in London on Jan. 16, 2011. The group stole his cash box but ran into trouble when they retreated to a parking lot to try to open it. Gavin Windsor, a G4S director, said the company’s cash boxes recently had been fitted with a new security system that coats the bills with glue — along with dye and a colorless, traceable liquid known as “smart water” — if it is tampered with. Police said in a statement Wednesday the gang was spotted by a witness less than an hour after the robbery as they struggled with the glued-up bills. Plainclothes officers swooped in and arrested Amponsah and Ocaya at the scene; Collins was arrested several months later. 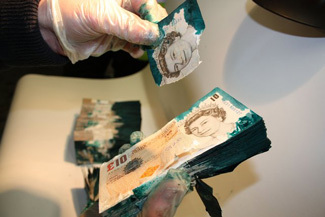 Although dye bombs and traceable solutions long have been used by security companies and law enforcement as a deterrent against cash robberies, Mr. Windsor said that using glue to gum up bills was a relatively new innovation, one he says his company and others have been working on.